The highly concentrated structure of the competitive landscape of the global surge arresters market ensures intense rivalry between leading players, finds Transparency Market Research in a recent study. 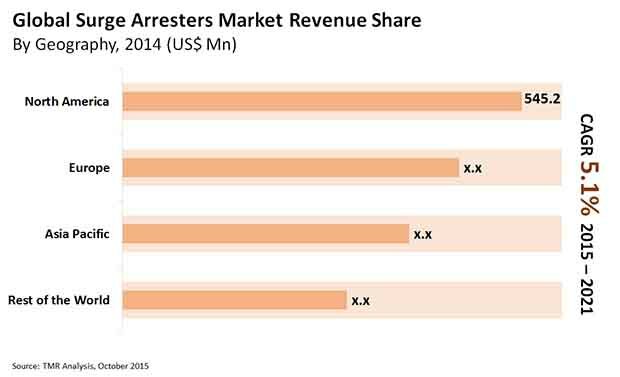 In 2014, the top five surge arrest manufacturers, namely, ABB Ltd., Eaton Corp., Schneider Electric, Emerson Electric, and General Electric, jointly held a share of more than 60% in this market. To withstand this competition, companies are currently focusing on technical advancements of existent offerings. Product innovation is also expected to gain prominence over the coming years in order to retain their positions in the global market. With the increasing disposable income, a growing desire for a comfortable living can be seen among people all over the world. Electronic devices play a crucial role in providing a comfortable life for the working population, which is why their demand is witnessing new highs on a regular interval. The ongoing technical advancements in consumer electronic appliances are also creating a huge demand for them. In order to function properly, these appliances require a steady uninterrupted supply of power; however, in most of the cases, they lack inbuilt protection from electricity fluctuation. The irregular flow of power may result in fire and damage household items and their surroundings. Surge arresters, such as voltage regulators and surge protectors, provide efficient protection against such electrical damages by adjusting and normalizing power consumption, ensuring the safety of electronic appliances. The growing need to protect home appliances from sudden surges in electricity is boosting the demand for surge arresters significantly across the world. Analysts at TMR expect surge arresters to witness a healthy rise in demand over the forthcoming years too. In emerging economies, the rising concerns over the depletion of natural energy resources have created a huge opportunity for the production of electricity from non-renewable resources. This imminent growth in power generation is anticipated to present an opportunity-rich market to the manufacturers of surge arresters. However, the additional cost involved in the installation of these devices may hinder this growth to some extent over the years to come. Transparency Market Research estimates the global opportunity in the surge arresters market to increase from US$1.7 bn in 2014 to US$2.4 bn at a CAGR of 5.10% between 2015 and 2021. Among the regional markets, North America tops the list in terms of the surge arrester consumptions. In 2014, the region generated a revenue of US$545.2 bn, accounting for a share of 32% in the overall market. By 2021, the contribution of this region to the overall revenue is expected to increase to US$775.1 bn. However, due to the strong performance of other regions, it is likely to witness a decline in its overall share in the years to come. The high voltage surge arresters segment has occupied the key position among all the product segment. Analysts predict it to remain the same throughout the forecast period. Surge arresters will continue to find utmost demand in industrial applications over the forthcoming years, says TMR.